Аннотация к книге "Barbarians at the Gate"
The battle for the control of RJR Nabisco, which became the largest and most dramatic corporate takeover in American history, sent Shockwaves through the international business world and became a symbol of the greed, excess and egotism of the eighties. Twenty years on, the world is once again recovering from a period of financial extravagance and irresponsibility. 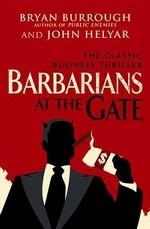 This new edition brings the ultimate business thriller up to date for a new generation of readers.